What follows are two lists. The first are all televised appearances of John Wayne that occurred during his lifetime. This list does not include every time a John Wayne film appeared on television, nor does it include television commercials for John Wayne films, unless the film promo featured something only seen on television. 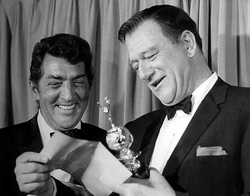 The second list features every televised appearance of John Wayne after he passed away. Most of these appearances consist of archived footage of John Wayne, but some of them include friends or family members speaking about John Wayne. As with the first list, the second list does not include John Wayne films or film promos that appeared on television.